Target ranging can be based on height of the target or width. Pretty ingenious. What has me saying “geez why did no one think of this before” is that the optic uses the diamond as a quick BDC for 0-300 yards, and is subtended in MILS from there on out. Inside of 300 yards, many of the .308 and 5.56 loadings just don’t rise or fall enough to make you miss a man sized target with a 200 yard zero. Past 300 yards, the variety of loads put through a rifle really begin to show differences with regards to velocity and bullet drop, etc. Having a MIL reticle will allow you to map out the drop value for any number of loadings you may push through your rifle. The center diamond is a sweet spot for 5.56 and 7.62 loadings. In summary, I like this entry into the market. Its 14oz (very typical weight) and otherwise looks none too special, but it’s the well thought out reticle that grabs my eye. Unfortunately, I am not in the market for a 1-4x variable at the moment, but it may suit your needs well. Click here to check it out. Here is to hoping it gets favorable reviews and has a satisfactory build quality. Price runs at $299 as an introductory special. This intrigues me. I’m not in the market for another 1-4x at the moment, but this has a lot of features that I like. Same here. Looks cool, and does a few new things, but 1-4x isn’t in the cards at the moment. 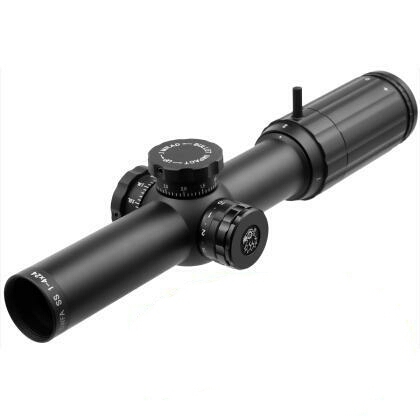 Would that I’d started reading your blog a week earlier and seen this when it was at the intro price, I’d have snagged it rather than the Primary Arms advanced micro and flip-over 3x magnifier that I ended up getting. What did you think of the glass? I down to this or a vortex viper PST. The vortex glass seems pretty darn good but the retical is a little skinny for my old eyes and I really like this one. 400 is about the max range I shoot with 5.56 anyway with most being 3 gun range of 20-150 or so. The post was a preview, and I do not have a 1-4x variable for physical review. Let me ask SWFA if they will oblige! ← Where Does the Industry Go From Here?